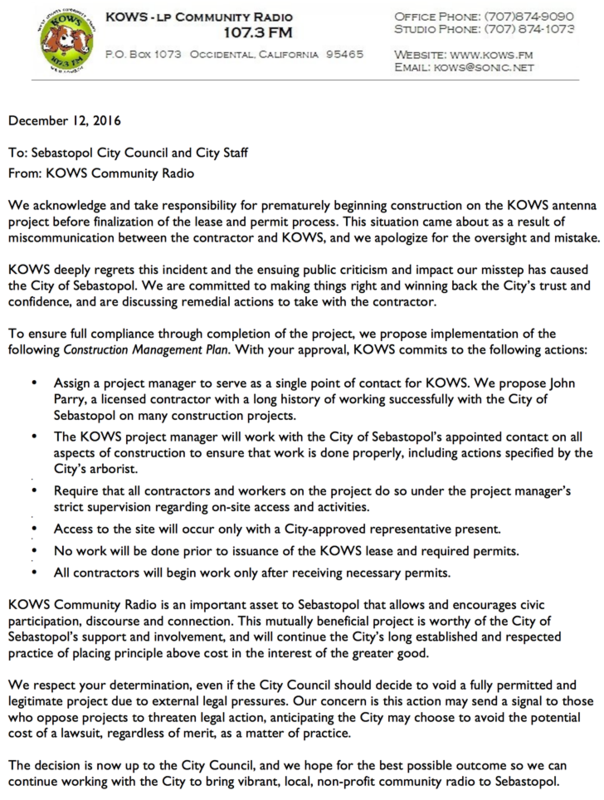 On Monday, November 28, KOWS radio authorized its contractor Schafer Electric to trench through 320 feet of mature tree roots on Sebastopol’s Pleasant Hill Road water reservoir site without a permit, as confirmed by Sebastopol Planning Director Kenyon Webster. Schafer was on the job site along with the backhoe operator. No one from the City was present, although the still unsigned land lease agreement between KOWS and Sebastopol stipulated that a city staff member must always be present when a KOWS representative was on the property. The KOWS backhoe operator obliterated the roots of more than a dozen 40-50 foot Italian Stone Pine trees that were planted over 30 years ago to screen the water tanks from the surrounding neighborhoods. The 3 foot deep, 15” wide trench is littered with mangled roots, some as big as a human limb, severed within a few feet of their trunks. An arborist who visited the site today was shocked at the devastation. He said it was extremely rare for cities to allow any trenching around mature trees without an arborist on site. Once he understood that the KOWS backhoe was operating on the site illegally, he said it was a criminal act against the trees and that the trees will have an extremely difficult time surviving over the next 10 years. The route taken by the backhoe on Monday bore little resemblance to the one submitted with the KOWS application to the City. On those plans, the trenching path avoids most of the trees and stays closer to the tanks. Somehow the original 300 feet path became 415 feet, right through the gorgeous mature grove of pine trees on the property. Work has been stopped by the City of Sebastopol and city officials are evaluating the next course of action, according to the Planning Director. With NO Permit: KOWS Trench 300 ft, Displace 1800 cubic feet of Soil, and Cause Permanent Tree Damage. As a city council member elect, I personally visited the site and talked with city staff about the KOWS trenching. After talking with city staff, I found out that KOWS has not yet signed the lease agreement with the city. There was also no encroachment permit, no building permit, no insurance, no building department official present, and that the route for the trench was to be determined in coordination with the building department, which did not happen. All of these were violations of the conditions of approval that were subject to the lease agreement that has not yet been signed. It makes me wonder if anyone at KOWS even read the lease agreement. Finally, the Sebastopol General Plan includes a chapter highlighting the "Rights of Nature" which in this particular case, we find absolute derogation of those rights. I for one, would like to hear a public explanation from KOWS as to how and why this happened. 1. A tree protection plan shall be submitted with the building permit or improvement plan submittal in accordance with Ch. 8.12 SMC, Tree Protection. This plan shall be prepared by a certified arborist and give specific measures to protect trees during project construction. 3. All underground lines shall be routed such that a minimum amount of damage is done to tree root systems." After talking with city staff, I found out that KOWS has not yet signed the lease agreement with the city. There was also no encroachment permit, no building permit, no insurance, no building department official present, and that the route for the trench was to be determined in coordination with the building department, which did not happen. Last edited by Barry; 12-02-2016 at 08:02 PM. The Glorious Italian Stone Pine Trees. Severed tree roots 18" in circumference. Severed sapling tree 16" in circumference. Last edited by Barry; 12-05-2016 at 07:57 AM. There are ways to do this kind of excavation without harming trees. This website provides more information on preserving tree roots during trenching, and photos of projects where this method has been used. Last edited by Barry; 12-06-2016 at 09:27 AM. The following is excerpted from the Arborist Report submitted yesterday by the city's arborist, Becky Duckles. Her report includes findings that two Italian Stone Pines are damaged to the extent that their immediate removal is recommended. When the electrical contractor for KOWS went on site last week to excavate a trench for the radio tower, many roots of the mature Italian stone pines and other trees were ripped and broken by the equipment when the contractor dug a 13-15" wide, 3' deep trench for conduit. The length of the excavated trench was approximately 300' with a short section uncompleted near the proposed tower pad location... The root damage was severe on approximately 4-6 trees, and significant on 10-11 trees. The damage to the trees was egregious and preventable. With plan review and input regarding tree protection this damage could have been avoided almost entirely. A different route outside tree root zones would have been planned, and reportedly had been requested by the City. Typically roots 1-2" and larger are required to be preserved during construction of similar projects. Where work had to occur within tree drip lines/ root zones, a construction-monitoring arborist would have directed the excavation with various techniques to preserve roots. A combination of Air Spade (high-pressure pneumatic hose) and hand digging is the best technique for avoiding root damage, with arborist -monitored use of small excavators and hand digging the most common when working within tree root zones. When equipment approaches tree root zones, usually inside the drip lines, the arborist directs the digging until roots are found, then careful hand digging exposes the roots, and conduit or other lines are installed under the preserved roots. The soil on the site is sandy with few rocks, and the conduit was placed at the bottom of a 3' deep trench. Most of the roots were growing between 2"-24" deep, where 90% of most tree roots grow on typical sites. No roots 1" or larger were seen which couldn't have been avoided and preserved because of their depth or location. There was sufficient room for cover over the conduit and backfilling without damaging roots. No tree protection measures were followed during this work. The first thing to be done within the next few days is to have an arborist or qualified tree service provider (under the supervision of an arborist) recut all damaged roots ½" diameter and larger. With loppers for ½" roots, and a sharp pruning saw for those 1"+, the roots shall be cut cleanly across the face of the root past the damaged portion. Where tree trunks are close to the trench on both sides, roots should be cut on both sides of the trench. Small, viable flexible roots shall be left uncut and tucked back into the trench at the time it is backfilled. No treatment of the cut roots is recommended. Backfilling of the trench should occur within a week of the root re-cutting. After the trench is backfilled, the two trees to be removed should be taken down. Chips from the removal should be spread on site under the remaining trees. There may be signs of decline from the root damage manifested on the affected trees over the next few years. Considering the species, size, soil, site and age of the trees it is most likely that the trees will show decline within the next 2-3 years. Generally when temperatures are high in early summer, after the first flush of new growth, signs of stress will be evident. The most likely symptoms will be branch dieback, often starting with thinning foliage at the tops of the crowns and branches dying successively. It is possible that a couple of the most seriously impacted trees may die. We will schedule site visits regularly for the next two-three years to monitor the condition of all affected trees. If significant decline or branch dieback is noted, the arborist will immediately notify the City and provide recommendations to reduce any hazard and improve tree health. We will note the cause of any future tree failures. Where trees are removed or possibly die, I suggest that they be replaced with 24" box specimens of the native Western red cedar (Thuja plicata), coast redwood (Sequoia sempervirens), coast live oak (Quercus agrifolia) and/ or deodar cedar (Cedrus deodara). There is room for two trees where the 43" pine will be removed, but no additional screening or tree planting would be needed where the 17" tree will be removed close to the tank. In a separate document I will provide the estimated cost of arborist monitoring of the trees for three years, and estimates for the installed, 24" box trees. Last edited by Bella Stolz; 12-09-2016 at 12:05 PM. Thank you to "...Charlottesay" for providing the updated news on the condition of the trees. I was sickened to my stomach as I read it and had to emote grief afterwards in response to the unnecessary loss looming in that majestic grove. I'm sadly appalled that KOWS has not publicly apologized for their actions nor here in this thread or on their KOWS website. It rides up there with the audacity of an oil company proclaiming they will stop at nothing to run their trench under a lake. I truly appreciate the diversity of community radio shows KOWS provides and am deeply hurt by their misuse of public trust and lack of ownership to the matter. I suspect they will try to "blame" the person with the backhoe and that is a victim mentality approach and not of a conscientious citizens representing the goodwill of West County. There was a process that needed to be followed and I am baffled by how KOWS simply did not inquire with the city, "what do we need to do next" after receiving the approval for the 35' tower. Last edited by Bella Stolz; 12-09-2016 at 12:07 PM. I sure would like to hear what our good friends at KOWS have to say, even if it is we goofed up, sorry. I just learned that KOWS Radio doesn't even have an approved FCC license for the new location. This makes it easy to Just say NO to KOWS radio! With a sprinkling of trespassing and dash of tree destruction. Attached is a list of the trees affected by KOWS' illegal trenching: their size, species, distance from trench, etc. Trees #5 and #10 are the two Italian Stone Pines that Becky Duckles, city arborist, has recommended for removal due to elevated risk of failure. Her report says that the root damage was severe on approximately 4-6 trees, and significant on 11-12 trees, which includes every mature tree on the site near the trench. Last edited by Barry; 12-11-2016 at 01:41 PM. And with total disregard for the trees. Could it possibly be worse? What happened to these stately old trees cannot be characterized as some sort of a “misstep” which is how Laura Goldman grossly understates it in her letter to Sonoma West Times. That’s kind of like saying that beating up your wife is a misstep. KOWS has beat up 16 trees and two of them have to removed now (killed) because of the extreme damage. She then goes on to blame it on poor communication between KOWs and their contractor – as if administrative fog and incompetency somehow make it all OK. Tell that to the trees, Ms. Goldman. Two independent arborists concur that 16 of these huge old trees have been severely damaged, and in time the full impact will become apparent. We will see it when chunks of the magnificent canopy start to die off and when trees start to lean and break. Limbs will fall and perhaps more trees. As previously stated, the root damage to two is to such extent that the trees need to be removed now. What KOWS did was COMPLETELY illegal, grossly negligent if not criminal, and it has caused irreparable HARM to SO MANY grand old trees which WILL SHOW in time. KOWS is responsible for egregious violations across the board and they should be treated according to the law. What they did is an insult to the City and an insult to nature. There is no excuse. They should NEVER have access to that property again. KOWS should be held fiscally responsible for the damage, including replacement trees from a nursery on site. The City should never again engage in business with this partner on a supposedly secure water storage site, who has demonstrated that they are totally irresponsible, reckless and downright dangerous. At the last City Council meeting, in his farewell speech, John Eder said something I much admired for its honesty. He said that the City Council, including himself, wasn’t always “morally courageous.” He went on to say that being on the City Council isn’t a popularity contest. Please encourage the City Council to be morally courageous at this time. Ask them to uphold our laws, our General Plan and to respect the Rights of Nature. The protection of nature is their sacred trust. The protection of our laws is their civic duty. Ask them to tear up the as yet unsigned lease and never let KOWS on their property again. Attached is a map of the Pleasant Hill Reservoir site, showing both the route of KOWS' illegal trenching, and the route provided by KOWS on its project application. This map also shows numbers and locations of all of the affected trees listed in the second attachment. The location of the trench KOWS has dug differs from the location described in its application, and will exceed by 95 feet the 320 feet of trenching approved as part of the project (if completed). The new location of the trench harmed many more trees than the location in the approved project, as the city's arborist witnessed and reported. The illegal completion of about 80% of the trench severed the unprotected root systems of 16 mature trees (two recommended for removal due to the extent of the damage). This is obviously a major biological impact. All of the mature trees on the site screen the water tanks from neighbors' views, and were specifically cited by the Planning Director as precluding the need for any further landscape considerations for the project. The current damage and loss, and the potential loss of more of these trees in the future, will result in significant visual impacts as well. The substantial change to the project, not to mention the damage that has already been done, should now require intervention via the National Environmental Policy Act, and compliance with CEQA. KOWS has still not addressed the significant damage to sixteen 50 foot trees caused by the station's illegal trenching at the reservoir. "Out of order sequencing" of their construction project-- this is the extent of any admittance of wrong doing, made in KOWS' representative Laura Goldman's written statement to the Sonoma West Times and News. She is referring to the litany of omissions-- no permits, either construction or encroachment; no signed lease; no construction insurance; no permission to be on the site; no accompanying city personnel; no FCC approval-- required before digging 320 foot trenches. That is a lot of carts before the horse. But even if every "t" had been crossed and every 'i" dotted in terms of leases, permits etc, what about a PLAN for protecting the trees? What happened there? What about responsibility for awareness of potential harm, and strategies to avoid that harm? If KOWS had dug a trench with a meticulous and careful sparing of the roots of those sixteen giant trees, which could have been accomplished with one guy wielding an Air Spade, the roots would be fine. The trees would be fine. But that didn't happen. There was rushing and confusion-- now there is more confusion and finger pointing.Two huge trees are going to lose their lives. At least four more are in serious jeopardy. Where is the accountability, the integrity, the humility to admit that this was done on their watch and by their complete lack of oversight for what should have been an obvious and basic consideration? "Rights of Nature is the recognition and honoring that Nature has rights. It is the recognition that our ecosystems – including trees, oceans, animals, mountains – have rights just as human beings have rights. Rights of Nature is about balancing what is good for human beings against what is good for other species, what is good for the planet as a whole. It is the holistic recognition that all life, all ecosystems on our planet are deeply intertwined." Finally, the Sebastopol General Plan includes a chapter highlighting the "Rights of Nature" which in this particular case, we find absolute derogation of those rights. KOWS are fully licensed by the FCC. Please. Not the issue. Please look at the facts and please don't spread lies. I am sure they are as horrified as you are about the trees. They are not going on the air at the new location until they are licensed. First of all the station has a current license for the Occidental transmitter and a construction permit until February 17, 2017. This is why the race is on to get the station on the air. If not, they may very well lose their place in line. The construction guy made the mistake and didn't let the KOWS people know what was up, please don't pollute the air with mass accusations. You NIMBYS are acting like children that can't get their way. These are GOOD PEOPLE at KOWS. This is not a big corporation but your neighbors that want this station on the air, and you folks have no idea of what it takes to do community radio. There's no coordinated effort to piss you people off.. you made that up. And now you are using anything you can, true or not, to get your way, just like Trump. Last edited by Barry; 12-16-2016 at 02:20 PM. The race to get on the air was more important to KOWS than obeying the laws and protecting the environment. As a result, sixteen huge trees have been threatened and may die. KOWS has not received approval from the FCC to broadcast on the 92.5 frequency from the reservoir site on a 35 foot antenna tower, with a directional antenna. The construction permit that expires on February 10, 2017 is specific to a previous version of the project, involving a 70 foot tower and an omni-directional antenna. Right and they are not broadcasting yet either. They are totally legal. So stop conflating the issues. Each change requires a lengthy ( and expensive ) field report. All we know is that an ignorant contractor went rogue and did stuff on his own. Please stop assuming there was ill intent by the KOWS people. They are just as horrified as you are..
PEOPLE, JUST LIKE YOU, SCREW UP. And whoever is mailbombing this thread with too many lengthy documents to try and dominate this issue, please stop. This is a bullying technique and not appreciated. Use links. Last edited by Barry; 12-16-2016 at 02:22 PM. What I am hearing is that KOWS is legal to broadcast from Occidental and that's fine but that's not the issue here. The licence to broadcast from a different location on a different antenna is a completely different license and that is what we are discussing here . The Occidental license doesn't make them legal on Pleasant Hill Road. So, therefore, the correct answer is that they did the trenching with no city permits of any kind, and totally illegally according to the FCC rules. KOWS had as much right to trench there as did you or I. This resulted in severe damage to 16 mature trees -( and two of them will have to be pulled out as a result). A critical infrastructure site that houses the water storage for the City of Sebastopol was accessed without the City's permission. That's no small thing. Perhaps you can write it off as a "whoops", but if you hire a contractor, you are responsible for what you tell the contractor to do and when. Someone gave the contractor access to the site. We are responsible to know what the people we hire are doing and when they are doing it. Its called accountablilty. There was done with knowing disregard for the laws of our town and the FCC. No-one is that oblivious or naive. If they are, they should be nowhere near that site. You can characterize it as an "accident" if you want. "Unintentional" if you want. "A screw up" if you want. To me its too big for that. If no-one is held accountable for this, when is anyone held accountable for anything? What happened was egregious by anyone's standards, unless you have no standards at all. If you care nothing at all for the survival of 16 big trees (some of them are even protected species), and if you assign no importance to our own city laws or FCC laws, and if you don't care one whit for what goes on on a critical infrastructure for the city's water, then I guess its no big deal. No, the correct answer is that the FCC has nothing to do with the issue of the trench or the trees. They regulate the airwaves. They don't regulate what happens on the property. You are obviously not aware of the actual FCC rules. The station is correctly licensed with the current construction permit which is only thing required for CONSTRUCTION, and it allows testing to make sure it's within boundaries of reception. What is wrong is that SOMEONE took it upon themselves to start construction on city property without contacting the owners of the property. There's nothing that indicates FLAGRANT DISREGARD of the trees or property by KOWS or their officers, just by someone that acted surreptitiously, stupidly and unilaterally and without any consul.. This is similar to cases where a construction worker gets an address wrong and demolishes the wrong house. This cannot in fairness be allowed to use against KOWS without further information. I know these folks and am volunteering to help them get off the ground ( and out of Occidental ) because I think their mission is important to this community. Trying to connect KOWS as negligent by smearing the facts in this case is a childish tactic often employed by dishonest politicians, as we've seen. Don't fall for this rhetoric. This is an issue of trespass between the city and the trespassing parties, and should not be used as a reason to block the establishment of this radio station, despite the 'lists' presented here. There's been a lot of fake science and paranoia displayed in the past months by this ugly campaign that keep displaying so much ignorance and fact stretching. I get it. You just don't want to see the tower on your skyline, even though it's really on city property, and you anti-tower folks will say and do anything to try to get what they want. Please Don't co-mingle the issues. This is what 'certain' political figures do in a vacuum of facts. I have the most recent statement from KOWS, and their sincere apologies, which I am posting next. Last edited by Barry; 12-16-2016 at 02:24 PM. Last edited by Barry; 12-16-2016 at 12:59 PM. This morning, another huge Italian Stone Pine fell at the Pleasant Hill Reservoir. One tree has already fallen, and two more have been removed by the City of Sebastopol due to likelihood of falling. Now a fourth majestic 50 foot tree has come down. For anyone new to this story, 16 mature trees on the reservoir property, a secure site for Sebastopol's water storage, were substantially jeopardized when KOWS radio began illegally digging a 320 foot trench, tearing through major roots within a few feet of their trunks. KOWS, intent on erecting their antenna tower before their FCC window of opportunity shut, dug the trench without permits or permission, and without a plan of any kind to protect those trees. This self described community radio station has as yet to say one word publicly about the terrible assault on these trees and the enormous environmental degradation that has already resulted. Last edited by Barry; 01-13-2017 at 09:45 AM. EXCUSE ME - but they HAVE publicly replied, immediately after the event. Can you see? See it here. Stop trying to frame this as an intentional act, and think about how much benefit our town would have received had we had KOWS on the air during the storm. Hundreds if not thousands of people in West County could have been helped if their signal was on the air. WE NEED THIS STATION OPERATING and conflating the issues does not help. We've had hundreds of trees fall during this storm (in case you missed it), many in far more critical areas, and you have no proof that the tree loss you speak of was due to KOWS mistake. What have you NIMBYs done for the community lately, except to protect your own back yards and self interests? Stop piling on KOWS people - your extremism does not help the situation, or our community. You could help by finding a solution instead of complaining. You appear to care more about 'your' trees more than people, and are probably the person that filed the lawsuit. Sad. If KOWS had been online during the storm, one of the several already downed trees they trenched through would probably have fallen on their antennae tower and crushed it. I can't think of a less secure, reliable or trustworthy source of information. Thousands of people received updates direct from the horses mouth to their cell phones - PGE. KOWS isn't paying you enough. Nice try though. We've had hundreds of trees fall during this storm (in case you missed it), many in far more critical areas, and you have no proof that the tree loss you speak of was due to KOWS mistake. These magnificent trees were a species that can live up to 100 years. They had already survived 30 years of wet stormy west Sonoma County winters, and had grown to 3-4 feet across, and fifty feet in height, before KOWS came onto the property. There is apparently something about the destruction of 40% of one's root supply that makes trees quite tipsy. Of the 16 mature trees unfortunate enough to line the backhoe path of KOWS illegal trench, 25% are now gone. KOWS' public statement makes no mention, in several hundred words, of trenching well within these trees' critical root zones, and the results of that trenching. There were no apologies, and no acceptance of responsibility, for actions that at that time had condemned two trees to removal (one subsequently fell on its own)--- after over a year of time to plan how not to plough through tree roots. You would think that planning would have been a priority. The latest huge tree to fall landed both on and off city property. A privately owned gate that allows access onto the neighboring orchard/vineyard was hit when the tree came down. Anyone passing through on a morning walk could have been seriously hurt. There's more to inform citizens about than if one's power is out. Have you even considered school closings (due to flooding), evacuation routes if we get a serious fire situation (yes dear, we live in a forest and that siren is to call the volunteers, not tell you anything else), earthquake emergencies, blocked and flooded roads, downed trees? How about when downtown was total gridlock due to the traffic lights being off? PGE won't give you that information and their little chat thing is well meaning but can't localize like a radio station. I'd consider PGE's reminder system spotty at best. I got two messages just after the power failure, then nothing the rest of the night until 11 the next morning. But apparently you're so fixated on hating these people for their mistake that you will never admit you might ever need them someday, let alone listen. Nimbys are never concerned about community or the common good, only their own self-interests. As far "as paying me enough" you appear to not even know what 'community low power radio' means and are just flailing now, without logic or common sense. NOBODY gets paid at KOWS ( note I don't work there but plan to help them), and you should know this. I'm just another citizen that is tired of these attacks on good, well meaning people. Sorry "your" trees are dead. Nothing can be done about that. But how about moving on and about caring about PEOPLE, your fellow citizens who could be served by this station. Oh, right, you were against it before just because you could. You just have more ammunition to hate. "Nice try" yourself. You are not going to win this argument. During an emergency National Weather Service interrupts programming for all types of weather hazards including earthquakes and man made disasters. NWR is an "all hazards radio network, making it the single source for the most comprehensive weather and emergency information." It is also my understanding that KOWS has continuously broadcast via radio from Occidental and via the internet which reaches anyone with a cell phone or computer. Parent knew if their kids could get to school without dependence on a local radio station. If a tree was down, we all knew how to turn our cars around and drive an alternate route. What you are describing is a convenience, not a necessity. None of that diminishes the value of local programming. It would just be more appropriate if KOWS was not held up as a Titan with the safety of our local world hanging on its shoulders. It simply isn't true. And as an aside, don't you think that if any entity branded themselves as being all about the local community, that they should mean it? Shouldn't they at least to pretend to care just a little about the 200+ local community families that didn't want a tower in their neighborhood? Particularly when there were other options that would bother absolutely no-one and give KOWS equal broadcast range? It works both ways. No anger or hate here. Just trying to keep it real. Thanks. can we say that anymore? I think that one-word phrase has been commandeered. People like the ones who wrote these anti-KOWS messages show their true natures. It's called kicking people when they're down. KOWS has already withdrawn the antenna application because the anti-antenna group pulled their Trump card. They threw high-rent lawyers at KOWS, something the station couldn't afford to defend themselves against. Last edited by Barry; 01-13-2017 at 11:17 PM. « (Previous Thread) need a one way ride to petaluma anytime/any day! Vote for KOWS 107.3 FM antenna relocation fundraiser!